The railroad tracks to Placerville were finally completed on March 29, 1888, some thirty years later than planned. But by that time the historically independent Placerville and Sacramento Valley Railroad no longer even existed, having been consolidated with ten other valley railroads into the Northern Railway, now under the control of the Southern Pacific hierarchy. The first passenger train arrived on April 9, 1888, while the first freight reached the depot on April 18, 1888. The occasion of the arrival of the first passenger train brought out nearly all the residents of Placerville and the surrounding towns. With only five days advance notice, the city was cleaned up and preparations for the celebration had been made. As the 500 excursion passengers pulled into the station, they were greeted by the boom of cannon, the blare of brass bands, and the cheers of the thousands assembled there. A large group of local citizens delivered welcome statements which were followed by an extended oration by California Governor, Robert Waterman. Festivities continued with a large parade twice around town and finally concluded with a huge banquet. The occasion marked an important event in the romantic annuls of transportation to and from Placerville which had commenced with pack trains only forty years earlier. Within the next few decades the rail line to Placerville became an important feeder branch-line for the Southern Pacific, carrying outward hundreds of carloads of freight annually, mostly lumber and refrigerated loads of deciduous fruit. With this important connection available, both the Earl Fruit Company and Placerville Fruitgrowers would establish major packing houses in the City and the Michigan California Lumber Company would build a connecting rail line from its lumber mill in Camino. A few miles to the south, in Diamond Springs, the California Door Company would establish its own connecting railroad line to bring lumber from its property near Grizzly Flat, adding further to the economy of the area. In spite of these improvements, Placerville would remain a quiet, rural county seat way into the middle of the twentieth century and the population increase slowly as people moved there to find work in one of the multitude of industries that kept the local economy alive. Agriculture, lumber and mining would remain the mainstay of local employment, until the winding, historic Highway 50 was replaced by the freeway. For years there had been plans to upgrade Highway 50 into a freeway and by the late 1960s it was completed from Sunrise Blvd. in Sacramento as far as Riverton. Placerville, now somewhat bypassed, became just a stop along this major highway. However, the businesses were successful in lobbying to have the freeway pass through town and have signal lights installed at three major city streets. Although this was a change from what was normally done, the State of California allowed it. Later the citizens would try to get them removed. It was only a short time before people working in the Sacramento valley discovered that it had become an easy commute from El Dorado County. The area in and around Placerville, being above the fog, below the snow and an easy drive from the Lake Tahoe area, rapidly became a bedroom community for the Sacramento Valley. New subdivisions began to develop in the area as more and more people found the foothills an ideal place to live and raise their families. Placerville, once a rural community of pioneer families began to change. By the 1990s the train tracks had been abandoned and the freight traffic that once moved through the City would switch to trucks. 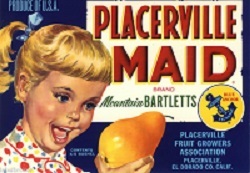 The Placerville Fruit Growers Association, as a result of a serious fire, had moved their facilities to Diamond Springs; apples and the Apple Hill Growers association with their ranch marketing concept would replace the large shipments of fruit to the Valley; and wine grapes, along with many new wineries, would replace many of the old pear orchards. The center of population had moved west as a result of large subdivisions in Cameron Park and El Dorado Hills, along with new commercial businesses west of the City. As a result, Placerville began to lose much of its identity as the commercial center for western El Dorado County. But, this proud City has not lost its history and prominent place in the Gold Rush and settlement of California and the west. Sources for this story include: “History of California,” by Theodore Hittell (1897); “California Gold Camps,” by Erwin Gudde (1975); “California Place Names,” by Erwin Gudde, 3rd Edition (1974); “Mother Lode of Learning – One Room Schools of El Dorado County,” by Retired Teachers Association of El Dorado County (1990); “I Remember…, Stories and pictures of El Dorado County pioneer families,” researched and written by Betty Yohalem (1977); “Mines and Mineral Resources of El Dorado County, California,” California Division of Mines (1956); “History of El Dorado County,” by Paolo Sioli (1883), reprinted and indexed by the El Dorado Friends of the Library (1998); the archives of the “Alta California,” “Placer Times” and “Mountain Democrat;” and the wonderful people at the reference desk of the El Dorado County Main Library.